This is part 4 of a series on Google Sign-In that began with a blog post on the user experience improvements that launched with Google Play services 8.3. We then discussed the API updates that make the programming model much easier. Most recently, we went into how you can use Google Sign-In to authenticate a user with your backend server. 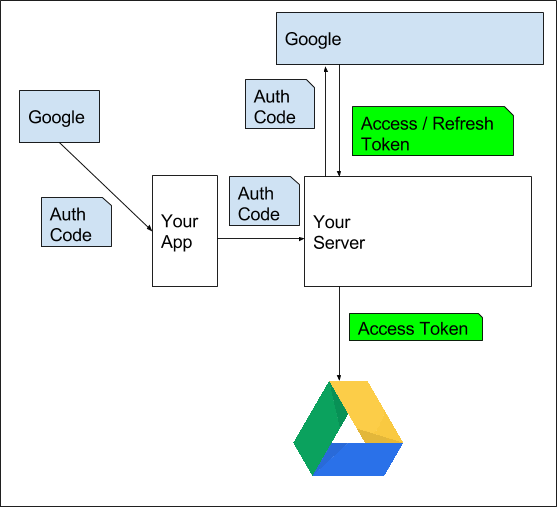 In this post, we’ll discuss how you can have your users sign in via your app to authorize your service for access to Google APIs, such as Google Drive, on their behalf. When using Google Sign-In, it is easy to extend your integration with Google by requesting additional scopes for API access after sign-in, like storing the user’s pictures of food in Google Drive. Typically, you should request this access incrementally (not at initial sign-in) -- i.e. in the context of a user’s actions (for example, after an app user’s order has been delivered and they’d like to save a copy of their food photos), following best practices in user experience to make it most likely that the user will grant access, and aligning with the runtime permissions model in Android Marshmallow 6.0. When you do this kind of integration, you probably want to access data from your server, so that you can continue to have access when the user is offline, or to store user-generated data in your own database. This flow would look like Figure 1. This also has the advantage of working across all platforms. Figure 1. Accessing Google Services with Credentials. Step 1: As with the scenario in server authentication covered in the previous post, this sample provides canonical code for your Android app. In particular see the ServerAuthCodeActivity. This requires you to get a web client ID for your server. Details on how to obtain this are available here (see Step 4). In this case, the scope DRIVE_APPFOLDER is requested, meaning that the user will be asked to give the app permission to access their Google Drive. In addition to this, a server auth code will be requested. This auth code should then be sent to your server using HTTPS POST, and, after it is exchanged, will give your server access to the user’s Google Drive. [Important: you should send the code in an authenticated call to your backend to ensure that it is a legitimate request from the active user]. String CLIENT_SECRET_FILE = "/path/to/client_secret.json"; // Be careful not to share this! If a refresh token is available, you can persist the credentials using StoredCredential for later use if you need ongoing access to the API on behalf of the user. This demonstrates the use of Google Sign-In credentials where your server can make Google API calls on behalf of your users. To learn more about this, and all Google Sign In technologies, visit the Google Identity Platform website.